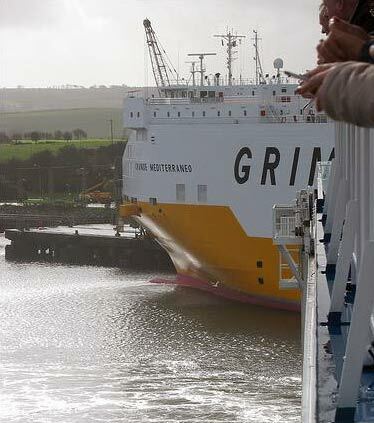 "Grimaldi, a family owned company, is one of Italy’s leading shipowners. In the early 1950s we introduced our transatlantic passenger liner service, and since 1989 we have been offering passenger services on our cargo liners as well. Currently 32 of our 50+ car- and container-carriers take passengers on our regular, frequent sailings from Northern Europe to the Mediterranean, South America and West Africa. All ships, with the exception of two, fly the Italian flag and are run by Italian captains and senior officers. The two exceptions fly the Swedish flag. Accommodations offered vary from inside upper- and lower-berth cabins to more spacious Owners’ double bed, side-facing cabins with separate sitting rooms. One of the great features our freighters are able to offer is the capability of also carrying passengers’ own vehicles (family cars, caravan-cars, motorcycles, etc.). On a freighter, freight always has priority. Passengers are, in a certain way, paying guests, who have to adapt to this fact. The service on board is simple, and sometimes cabins may not be made up in the most timely fashion. During peak working periods, the Captain and crew may not have much time to spare to look after the passengers. Port times vary according to cargo requirements; they may be short or long or happen during the day or night. Nevertheless traveling on our freighters will provide you with many pleasures. You’ll become a part of a team and enjoy the voyage on the high seas. Just make sure to have your passport with you and check the visa requirements. 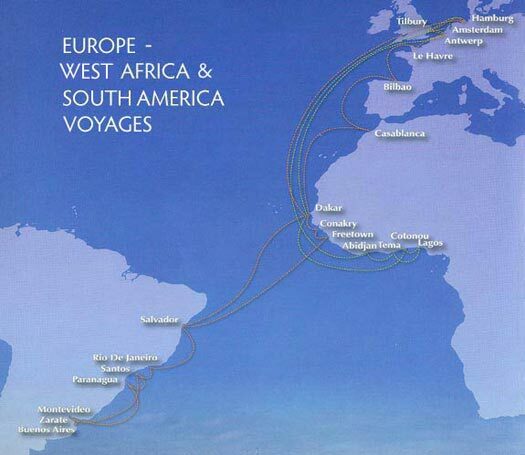 Our passengers come from all Continents. They appreciate the warm welcome they always receive on board our freighters. And we look forward to welcoming you soon". "Very attractive voyages include frequent port calls, all in one climate zone with almost continuous views of land and vessel traffic. Excellent variety of well prepared Italian food". €3,680 per person double, €5,520 single occupancy for the Owner’s side-facing double bed suite. 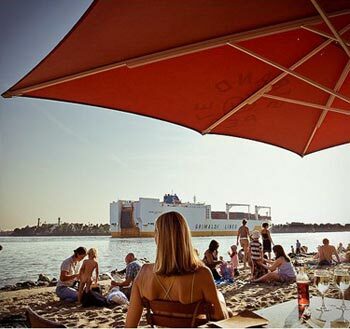 €3,680 for a single side-facing cabin, €2,885 pp double occupancy (2nd person using convertible sofa). €1,840 per person double, €2,960 single occupancy for an inside upper- and lower-berth cabin, and €2,345 per person double, €3,070 single occupancy for an inside two lower-berth cabin. The Grande Mediterraneo and Scandinavia type of vessel; built in 1998-2001, carrying 12 passengers, 4,650 cars, and 716 containers. €2,420 per person double, €2,235 per person triple, and €3,085 single occupancy, side-facing cabin. The Grande Italia and Spagna type of vessel; built in 2001-2005, carrying 8 passengers and 4,500 cars. 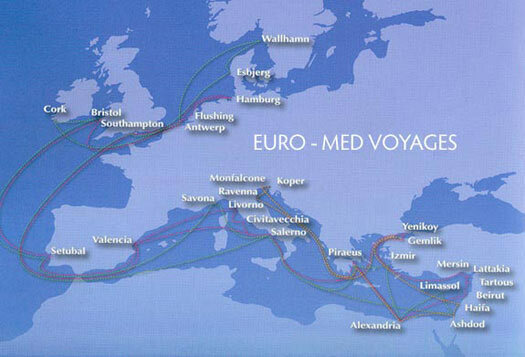 €1,065 per person, double; €1,645 single occupancy for an upper- and lower-berth, side-facing cabin. The Fides and Spes vessels; built in 1993, carrying 12 passengers, 2,400 cars and 504 containers. €3,935 pp double, €5,900 single occupancy, Owner’s side-facing double bed suite. €3,075 per person double, €3,935 single occupancy for a side-facing twin-bedded cabin. €2,030 pp double, €2,805 single occupancy for inside twin or upper- and lower-berth cabin. 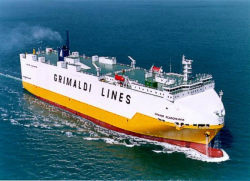 The Grande Africa and Nigeria type of vessels; built in 1998-2002, carrying 12 passengers, 3,500 cars, and 1,300 containers. €5,185 per person double, €7,775 single occupancy for the Owner's double bed side-facing cabin. €2,760 per person double, €3,865 single occupancy for an inside upper- and lower-berth cabin. 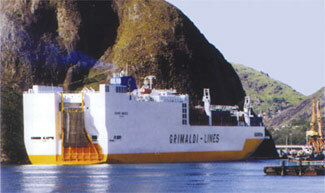 The Grande Francia and Brasile type of vessel; built in 2002-2004, carrying 12 passengers, 3,500 cars and 1,321 containers. All passenger accommodations and common facilities, such as the dining room, TV/bar lounge, small exercise room and self service laundry are located on the Captain’s Deck, one below the bridge. All cabins have private facilities with shower (a bathtub in most Owners’ cabins). The electrical current is 220/50 AC, requiring a two-prong round adapter and converter for North American appliances. There is an elevator on board, nevertheless passengers must be fully mobile and those aged 79 and over must have a Medical Certificate of Good Health. The age limit is 85. 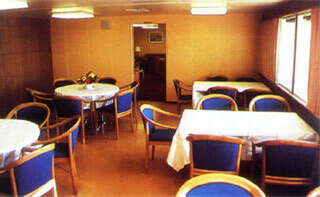 Dress code is casual and meals reflect the preferences and needs of the young officers and crew. A limited selection of wines and spirits is available in the ship's store. Onboard expenses may be paid for with cash in €. Tipping is at the passenger’s discretion; €3-5 pp per day is recommended. Telephone, fax and email connections are available through the Captain’s office. The fare may be paid for by check or wire (by exception only, credit cards may be accepted) in either the basic tariff currency, as quoted by the steamship line, or in USD/CAD at the prevailing exchange rate, subject to a final adjustment at the time the ticket is issued, a few weeks before departure. Passports must be valid for at least 6 months beyond the anticipated return date. Visa may be required depending on the voyage and nationality. Cancellation fees are as follows: over 60 days, loss of deposit; 30-59 days, 50% of the fare. No refund will be made within 30 days of departure. To protect your investment, Cancellation and Interruption Insurance is highly recommended. Travelex Insurance packages, covering you from the moment you buy the policy, are available to all Maris customers, worldwide, on our website page "Before You Sail".